A pair of young women served him shirred eggs and dispatched him to a couchette, where he fell into a profound sleep. 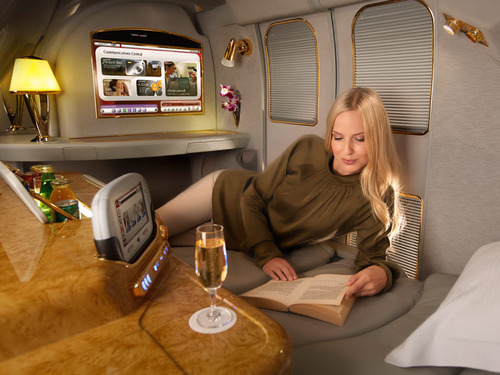 For $19,130 a ticket, Emirates Airlines cradled passengers from New York City to Dubai in a private suite with a sliding door and a seat that reclined to form a bed. The thirteen-hour and twenty-five-minute flight was punctuated with seven-course meals served on Royal Doulton china. He woke over a blue expanse decorated with islands in the shape of Arabic characters. 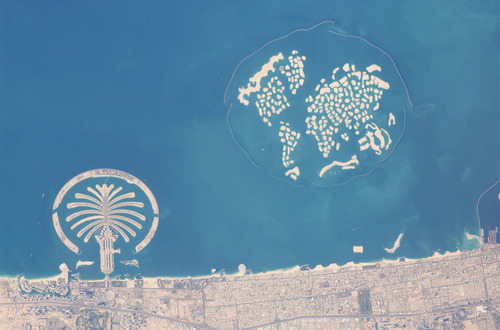 These were the Suras, the Emirate’s latest project, 114 luxury islands. The Palm Jumeirah is a palm-tree shaped collection of islands that the city claims is the eighth wonder of the world. The World is, naturally, an archipelago of 300 islands that forms a world map in miniature. Currently, only two of the 300 islands have been developed: Greenland and Lebenon. There were no clocks anywhere. The surfaces sparkled. The air was richly oxygenated. Cohen was staying on the top floor of the Haj. From his window he counted 143 cranes. The Burj Al Arab is, perhaps, the world’s must luxurious hotel. Opulence threads every seam of the sail-shaped structure. Each of the 202 double-story suites comes with 24-hour butler service just outside the door. Should you need to escape, the helipad may be accessed on level 28. A Bloody Mary appeared in his hand. “Agassi and Sampras played tennis right where we’re sitting. You seen either of those guys play?” The sheik drained his Bloody Mary. In 2005, the hotel Burj Al Arab’s helipad was covered in grass for an exhibition match between tennis stars Andrew Agassi and Roger Federer. 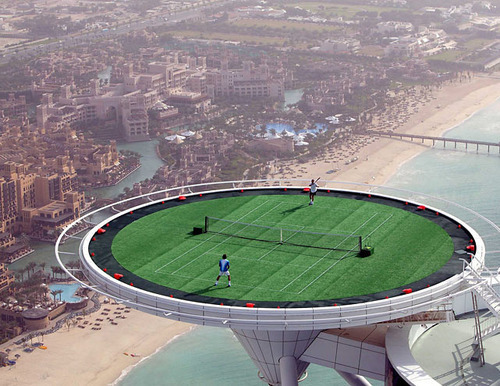 Occurring at 1,053 feet above the Arabian Gulf, the media stunt promoted the Dubai Duty Free Tennis Championships. Cohen sat beside the sheik’s nephew in a canary-yellow Hummer and gazed at the far end of the strip. Cars are the best way to peacock. Beyond make and model, vanity plates in the United Arab Emirates are a highly coveted accessory. The most prestigious vanity plate? That would be a single number: 1. In Abu Dhabi, the coup of being “number 1” was purchased at a 2008 auction for $14.3 million dollars. In Dubai, though, the top spot isn’t for sale. Vanity plate “1” is reserved for His Highness, ruler Sheikh Mohammed bin Rashid Al Maktoum. Want to get lost in this world a bit more? 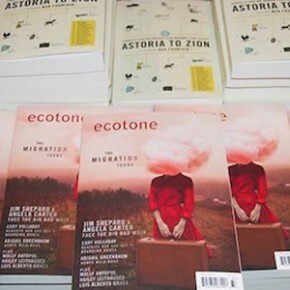 The complete story, “Hagar’s Sons” by Steve Almond, can be found in God Bless America (Lookout, 2011), or in the new anthology Astoria to Zion.